Kings XI Punjab (KXIP) left-handed batsman Chris Gayle suffered an injury during their last encounter with Mumbai Indians (MI). Gayle twisted his back while batting against Mumbai. His injury has become a cause of concern for KXIP skipper Ravichandran Ashwin. MI vs KXIP IPL 2019 Highlights: Mumbai Indians Wins by Three Wickets. Punjab played Mumbai at Wankhede stadium in the match no 24 where they were put into bat first. KXIP posted a massive total of 197/4 where both their openers Gayle and KL Rahul played well. The former scored an unbeaten 100 from 64 balls which is the fourth hundred scored by a batsman in IPL 2019. The southpaw Gayle too played an amazing knock of 63(36) which included 3 boundaries and 7 sixes. IPL 2019 Today's Cricket Match Schedule, Start Time, Points Table, Live Streaming, Live Score of April 11 T20 Game and Highlights of Previous Match! Chris Gayle due to injury was not even out for fielding during MI chase. KXIP coach Sridharan Sriram told the reporters that the Jamaican cricketer Gayle will be monitored over the next few days. KXIP will hope that Gayle recovers soon as he is the main backbone of Punjab's batting line up. 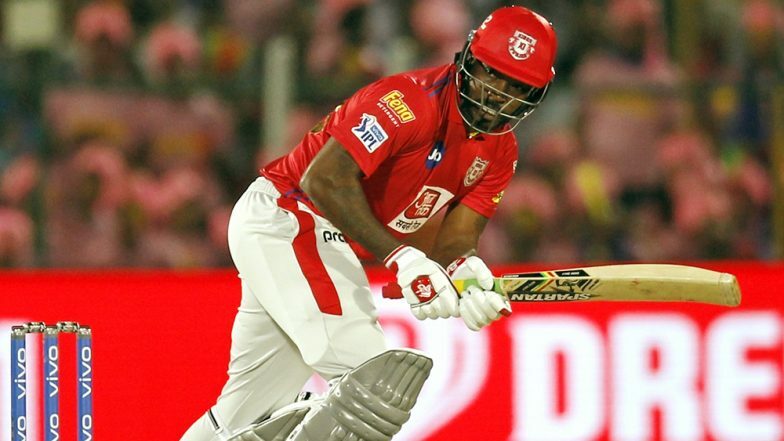 KXIP lost their match to Mumbai Indians due to the blistering captain knock of 83 from 31 balls by Kieron Pollard. Pollard led the Mumbai side in their last game, as Rohit Sharma pulled his muscle prior to the match. Adding an insult to the injury, KXIP pacer Ankit Rajpoot also injured his finger during the match, the right-arm medium fast bowler went expensive against Mumbai with the figures of 1/52 in 4 overs.